A dining table with a look and feel all its own, the Grapeland Heights Dining Table from Zuo Modern is sure to enhance any dining room's décor without delay. This dining table boasts a mid-century modern design, giving the piece a timeless appearance. Meanwhile, the table includes a dazzling walnut finish as well as a matte black with wood grain top, ensuring the piece will maintain its quality for years. Choose a deluxe dining table that will look great and perform beautifully every day – the Grapeland Heights Dining Table. 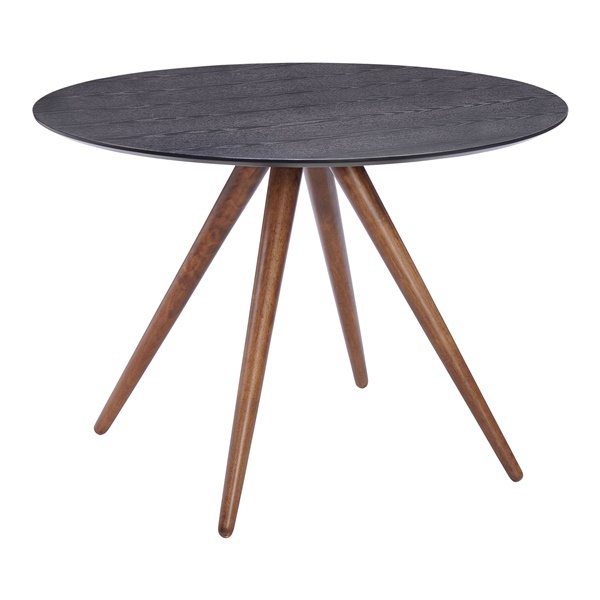 Includes splayed legs that give the table a modern look and feel. Walnut finish provides the table with an all-natural appearance. Mid-century inspired design makes the table a wonderful choice in both modern and retro dining rooms. Round tabletop offers ample space. Matte black with wood grain top will maintain its quality for an extended period of time.